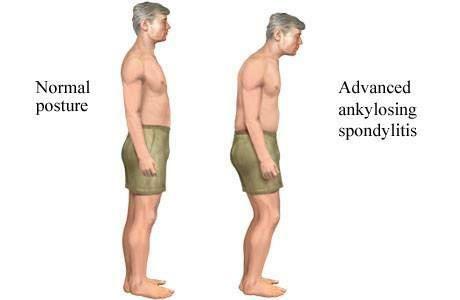 Ankylosing Spondylitis (AS) is a form of arthritis which affects the spine and may cause severe backache and stiffness. Ankylosing, in fact, means stiff or rigid, and Spondylitis is spinal inflammation. AS can affect other joints, for example, knees and hips. Early diagnosis is important in every form of arthritis so that proper treatment can be undertaken to control the pain and stiffness and thus reduce or prevent the chances of deformity. As yet no absolute certainty about the cause of AS but there is a strong genetic link. Common early symptoms of AS include hip and low back pain and stiffness which persists beyond three months. Stiffness is especially common in the morning. In the early stages, it may be difficult to diagnose AS. The reason for this is that the disease comes on very gradually and the x-ray changes in the sacroiliac joint considered necessary to make an early diagnosis may take several years to develop. Much can be done to control and reduce the effects of AS. Like all type of arthritis, AS should not be neglected. The right exercise, rest and medication are essential. The sooner a treatment regime started the better it will be managed. Exercise can include Hydrotherapy, a graduated resistance program such as Pilates and a home exercise program of stretching / joint mobilisation exercises.